Sony has been known for its design, while it launched amazing set of flagships every year, this year we saw two flagships, the Z2 and Z3. While there was no compact version for Z2, Z3 got a great smaller sibling to be proud of. As the specs sheet and phone in the real world proves that it is one of the best mini flagships to come out this year. The device has 4.6-inch (720p), Snapdragon 801 SoC, Android 4.4.4 Kitkat OS, 2GB of RAM and 16GB of internal storage. While it has all the hardware specs of a flagship, the USP of the device is its camera, which is 20.7MP on back and 2.2MP at front. For the Sony Xperia Z3 compact users, we wanted to share how you can improve your experience by using the tiniest of the tricks that your smartphone is capable of doing. Here are few FAQ, tips and tricks to get you started in improving the user experience on the device. How to insert the SIM card? How to insert the SIM card on your Xperia Z3 Compact? This might be the easiest thing that one shouldn’t be asking about it, but in the case of the Xperia C3, it is quite confusing. For those confused Z3 compact users, we recommend you to look carefully for the SIM card slot just below the microSD card slot. There are two pop-out doors on the left side of the device; the bottom one houses the nano SIM slot. You just have to slide out the SIM tray and put your SIM card on it, and then slide in the tray. There, you have successfully inserted the SIM card on your device. 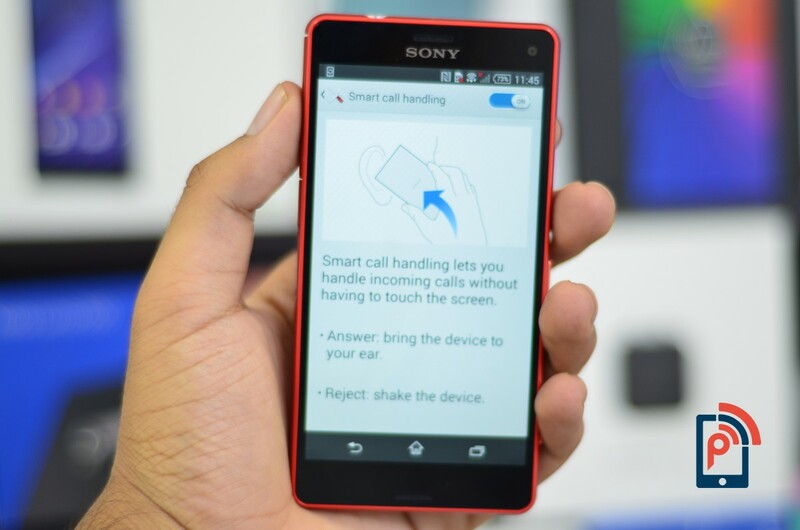 How to use the Smart call handling feature on my Xperia Z3 Compact? The gesture inputs are pretty amazing features that one likes to use on their smartphones. While Xperia Z3 Compact being the flagship device, it gets to have some interesting sensors stuffed inside it. And one such feature of Z3 Compact uses these sensors to smartly act whenever calls came in on your device. Here’s how you can use this feature. First, you need to make sure that Smart call handling feature is enabled. To do that, you need to go into settings area, and then in the personalization section. There you will find an option aptly named Motion, select it and enable the Smart call handling feature from inside the option. Now that the feature is enabled it is very simple to operate it accordingly. Whenever the call comes on your Xperia Z3 Compact, you just need to bring device to your ear and it will be answered right away. Or you can reject the call by shaking the device. 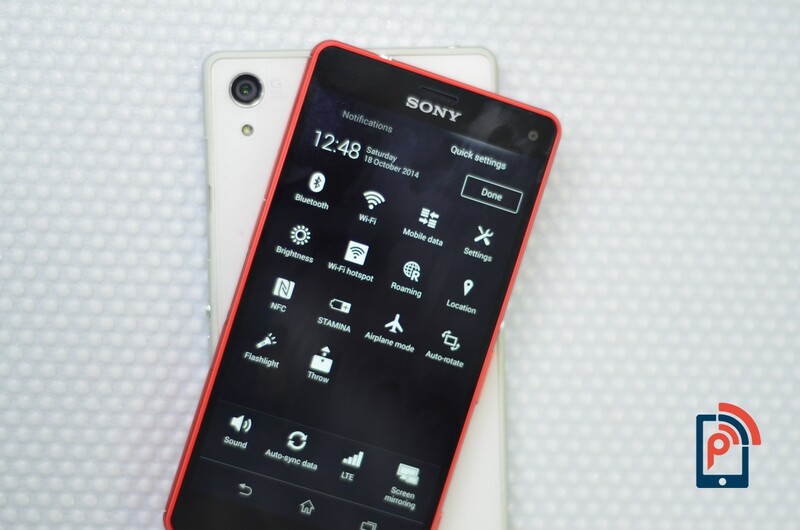 How to avoid late night wake up calls on my Xperia Z3 Compact? Use Smart Connect to put your Xperia Z3 Compact on a timer for silent mode and keep it quiet when you’re trying to catch up on sleep. Say goodbye to those 5am calls from forgetful friends in a different time zone. What is Simple Home Launcher on my Xperia Z3 Compact? The easiest explanation about this feature on your Xperia Z3 Compact is that, it is a minimalistic user interface designed to provide convenient home screen. It will allow the users to access the most recent apps, dial pad, and speed dial at their convenience. It will also show all the apps in the list format. So, in short, this is a pre-installed launcher on your Xperia Z3 Compact, which will allow you to have a simplest UI on your device. How to use the Android Beam feature on my Xperia Z3 Compact? This feature was also present on the Xperia Z3 model, which is fairly useful feature as it allows users to beam the content to another NFC-enabled device. For instance, the two NFC-enabled devices can beam contents like browser pages, Youtube videos, as well as the contacts and much more contents. To use this feature on the C3, first you need to go to settings area, and then to tap on the More in the Wireless & Networks section, which will open a list of options. From that list, you need to make sure that the NFC is enabled by checking the box in front of it. Now open the Android Beam option by tapping on it, and turn on the function whenever you need to beam the contents on other NFC-enabled devices. How to share your Data network via Tethering? This is one of the most widely used features of the Android smartphone and is almost same on most of the Android-powered smartphones, except in few smartphones like Samsung, HTC, Xiaomi, etc. Since, Sony has the same options settings, where it is mostly present in the Android stock OS, you can found this option in the same place. To remind you that, go to settings area, and then tap on the more option in Wireless & Networks section, which will open all the available options. 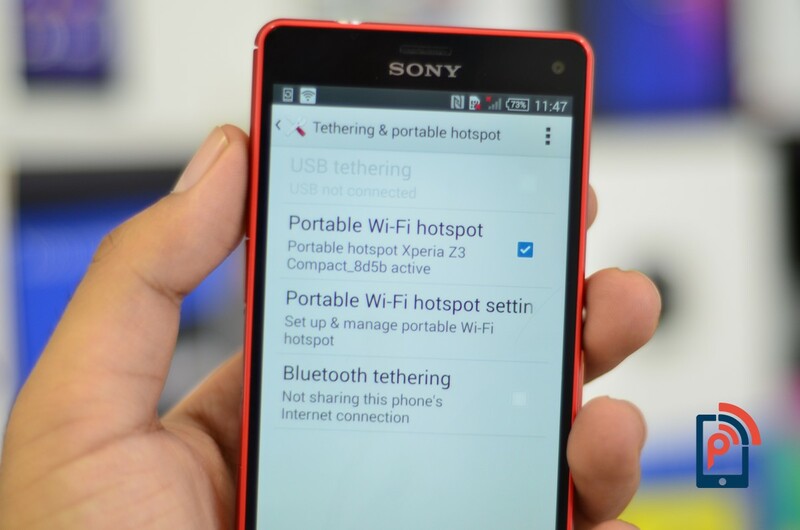 There you need to select Tethering & mobile hotspot option, where you can setup your Wi-Fi hotspot, and check the Mobile Wi-Fi hotspot option in order to share the data pack of your mobile device. Note that, your mobile data should be turned on, if you want to share the internet connection of your device. How to take a screenshot on my Xperia Z3 Compact? It is another easiest and most widely used feature of the Android operating system, which is just easily the same on the most Android-powered devices. You have to press the power button (found on the right side) and the volume down button to take a screenshot. And the saved screenshot can be directly viewed from the notification panel. How to check for Android Updates on Xperia Z3 Compact? To do that, you need to go to the About phone section, which can be done by opening the settings area, and then scroll to the bottom, where you will find that section. Now go to the first option in the About phone and tap on it, as it will start checking for any system update over-the-air. If there is any update, you will be notified right away about it. How to Install external apps with apk files? It is fairly easy to bypass this feature on the new Xperia Z3 Compact. You just have to go to the security options, when you go to the settings area. Now search the option aptly named, “Unknown sources.” You need to check the box in front of that option. There you go, now you can simply install the apk files directly from your device. But do remember that, installing the apps form unknown sources might damage your new device. How to edit Quick settings in Notification Panel? For large screen high-end devices, you will notice quick setting panels as there are tons of functionality available on that device. Even though, the Xperia Z3 Compact is not so large device, there is always a need of a quick settings panel, which can be easily editable according to the needs. The settings are exactly similar on your Z3 Compact. To edit them, users need to go to the notification panel and jump to the quick settings, where they can notice edit options right in front of the time and date. Selecting that would open the new set of settings that you can drag to the quick settings area and then select done to go back. That’s all. How to use my Xperia Z3 Compact when wearing gloves? This feature is quite useful to the part of the globe where people have to wear the gloves all over the winter or in some specific countries the winter is all over the year. The glove feature is mostly helpful to those consumers, as it allows the proper usage of touch screen interface. When you enable this feature, the smartphone increases the sensitivity of the screen as it becomes hard for screen to detect a touch while you are using your smartphone when wearing the gloves. How to Manage App Drawer – Sort, Uninstall, Hide apps? There are many customized User interfaces out there in the Android smartphone ecosystem, as it allows full customization. While some companies like Samsung has not able to tap the best use of that because there TouchWiz UI is pretty much the slowest UX based on Android. Whereas Sony Xperia series has one of the interesting and smoothest interfaces among other Android UX. It is just easily being manageable right from a left swipe as it will open the more options for managing the app drawer. That includes the searching of apps, uninstalling, as well as sorting in alphabetical, most used and installed ordered. You can also directly go to the Sony’s little market, which shows the recommended apps by the company. 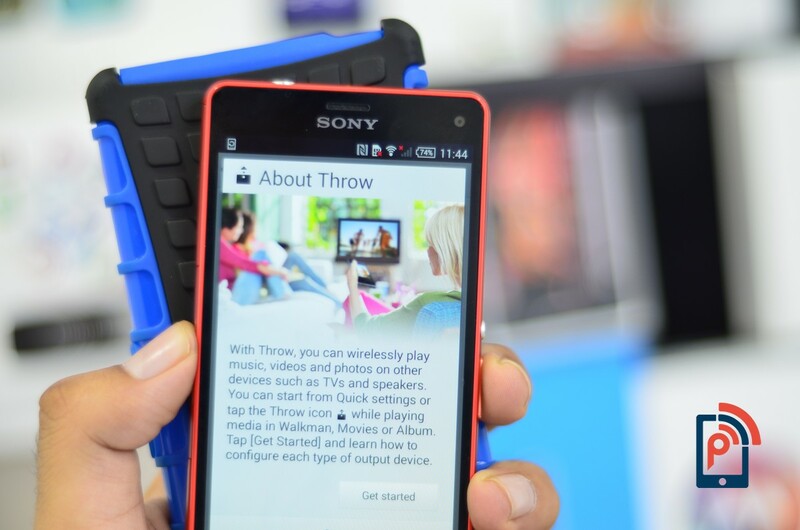 How to push content from your Xperia Z3 Compact to the TV? While there are dozens of uses of NFC, you can also use it to mirror video content on your TV. To do that, you need to go to settings, then Xperia section, where you will find Mirroring option. Now have the phone search for the suitable NFC-enabled device. Unfortunately, so far it only works with the Sony Bravia TV with NFC that the company demoed at CES. For any other device, you need to go to settings and then tap on a feature aptly named Throw. It uses the widely supported DLNA tech and your Wi-Fi connection to push video and music to your TV or speakers. Or users can also push content to their chromecast via the newly added support of the companion app of Chromecast, if you have the Chrome compatible TV or device. Will the Sony Xperia Z3 Compact phone get Android 5.0 Lollipop update? Yes, it will be getting the update of the Android 5.0 Lollipop. Google has announced that the final version of its much-awaited next version of the open-source operating system, Android, will be released in November. Sony is known to keep updated their flagship devices as soon as the major Android versions releases. It seems like company is committed to maintaining their trend with Xperia Z3 model. So, they have already confirmed about the launch of Lollipop update for their Xperia Z series of handsets, which positively include the Z3 compact.